Ingredients Fresh Tomatoes, Tomato Paste, Pure Olive Oil, Fresh Garlic, Fresh Basil, Onion Powder, Garlic Powder, Natural Herbs and Spices. Catanzaro Food Products derive their roots from Termini Immerse, Sicily. Most of the men in the family were fisherman by trade and would often spend days at sea. Waiting patiently for their husbands to arrive home, wives would watch for the ships to come into port. 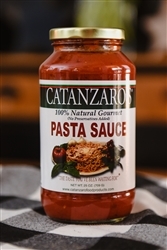 Rushing home to cook up a meal, they would grind up fresh tomatoes, garlic, basil, and other ingredients to create a mouth-watering sauce that would enhance any meal. Our sauce, using the same ingredients our family used in Sicily for four generations is ready to complement any meal you may create.